Heritage Christchurch, set in the 100-year-old Old Government Building (OGB) on Cathedral Square, has been formally reopened by the Governor-General of New Zealand, Lt Gen The Rt Hon Sir Jerry Mateparae. At the ceremony, Sir Jerry Mateparae highlighted the strategic location of the Heritage Hotel in his speech to guests that included local and central government politicians, celebrities, Heritage Hotels’ business partners and national media. “The hotel sits in the heart of Christchurch. The reopening of the Old Government Building is a potent symbol that Christchurch will be rebuilt, and that after the heartache of recent times, there is a brighter future ahead,” the Governor-General said. Hosting the official event was Heritage Hotel Management’s Managing Director, Mr Jeffrey Tang. Mr Tang acknowledged the importance of the hotel’s building in Christchurch’s architectural heritage and as part of the regenerating hospitality industry. “We are delighted to celebrate Christchurch’s ‘Heritage’ and the reopening of our beautiful century old hotel building, restoring it to the city’s priceless inventory of working historic buildings. We are privileged guardians of Christchurch’s architectural legacy and look forward to being part of a vibrant hospitality business future for Christchurch,” said Mr Jeffrey Tang. The Heritage Christchurch has been a part of the Christchurch hospitality industry since its opening in 1996 in the site of the former Old Government Building. The OGB, designed by Joseph Clarkson Maddison in an Italian Renaissance Palazzo style, opened in 1913 and is registered as a Category One Building on the Historic Places Trust register. 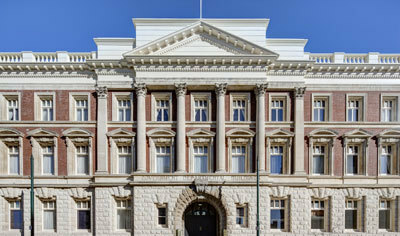 The building was awarded the Christchurch Heritage Trust Built Heritage Award in 2010 and the New Zealand Seismic Award 2012 in the Canterbury Heritage awards. Sequestered behind the red zone cordon for two and a half years, the building recently emerged ready to welcome visitors after a loving restoration. Also speaking at the opening event was architectural heritage expert, Dr. Anna Crighton, the President of Historic Places Aotearoa. “The building’s architect, Joseph Maddison, capped his distinguished architectural career with the design of this building. It is recognised as his finest work and undeniably the most impressive and imposing monumental heritage building in the city of Christchurch,” said Dr. Anna Crighton. The luxurious Heritage Christchurch Hotel offers beautifully appointed one and two bedroom suites and a fully equipped health club with lap pool, sauna and jacuzzi. For bookings and information, visit heritagehotels.co.nz.